Vibrant and happening, London is one of the top tourist destinations in the United Kingdom with millions of tourists visiting it each year. It is a city filled with landmarks - cathedrals and royal residences, the parliament, museums, beautiful bridges, high-rise buildings, numerous gardens and performing art centres to name a few. It is as though the city has been filled to the brim with attractions. You could spend limitless days exploring London and still not get bored. While there are numerous, wonderful things to see and do in London, today I will list down my top 10 attractions in London. The list is in no particular order, it is just that I like these ten places more than the others. The Tower of London is a historic castle on the north bank of the River Thames in London. It is one of the historic royal palaces and has been an important part of English history. It has been besieged many times and has served as a treasury, a prison, the Royal Mint, an armoury, a menagerie and of course home to the Crown Jewels. The Crown Jewels can be found under armed guard in the Jewel House at the Tower of London. Admission to see the Crown Jewels is included in the palace admission and I would recommend that you set aside an hour just to see these. The Tower of London has established itself as one of the most popular and most visited tourist attractions in London and a visit to the capital would be incomplete without visiting the Tower. Related - If you plan to spend a longer time in London, then this 4 day London itinerary will help you see the best of the city. Another 'must-do' and one of London's most popular visitor attractions is the London Eye. Also known as the Millennium Wheel, it is an extremely large passenger-carrying Ferris wheel situated on the banks of the River Thames. Standing at a height of 135 metres (442 ft 11 in), London Eye is the largest Ferris wheel in Europe and is visited by over three million people in one year. It is one of the most popular paid tourist attractions in London and so as with everything touristy, it is advisable that you book your tickets in advance and preferably go early to avoid the long queues. The views are fabuluous from the wheel and it is a lovely way to see the London skyline. Whenever family and friends visit us in London, they all want us to take them to the Tower Bridge! Not surprising because it boasts of superb architecture and is probably one of the nicest looking bridges in London. This landmark bridge is a combination of a suspension and bascule bridge and is around 800 feet in length with two towers, each 213 feet high, built on piers. In addition to admiring the exterior of the bridge, viewing it from either side of the Thames, you can also enjoy great views of the city and of the bridge itself from the the high-level Walkways on the tower. At 42 metres above the River Thames, the walkway with its glass floor offers excellent view of the road below and if you have timed it well, you can even see the bridge being raised beneath your feet! 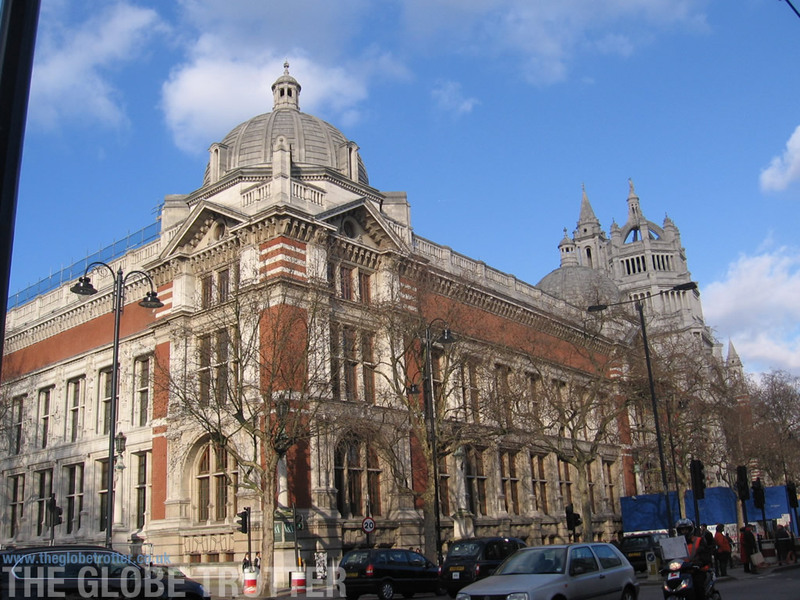 Victoria and Albert Museum is the world's leading museum of art and design, housing a permanent collection of over 4.5 million objects. Named after Prince Albert and Queen Victoria, it was founded in 1852, and has since grown to now cover some 12.5 acres and 145 galleries. From paintings to jewellery, from furniture to photographic collections and from wedding attires to embroidery and architecure, the collection at the museum is diverse and impressive. I can easily sum it up as an artlover's dream destination. My personal favourite is the Wallpaper collection at the museum which is said to be one of the fonest collections in the world. Admission to the V&A museum is free but some seasonal exhibitions and events carry a separate entrance charge. Located on the southern banks of the Thames, Greenwich is home to the famed Greenwich Meridian and Royal Observatory. Also located in Greenwich are the Cutty Sark (a restored 19th-century ship), the National Maritime Museum and the Royal Naval College (Painted Hall and Chapel). I love Greenwich. It is like a little world unto itself. It has everything needed for a great day out - beautiful buildings and museums to explore, the royal connect, London’s cable car, the O2, a beautiful riverside setting, lots of restaurants, London’s oldest Royal Park (Greenwich Park) and a local market that is great for street food and shopping. There’s loads to do in Greenwich and you can easily spend the entire day here without getting bored. The British Museum was established in 1753 and is home to around 8 million objects from around the world. Opened in 1759 the museum comprises of items ranging from early stone tools to Egyptian mummies and from Parthenon sculptures to twentieth-century art prints. The museum is huge and the exhibits are beautifully presented. We went on a day visit and as expected it was impossible to cover much. If you love museums, you could spend days at this museum and soak in all that it has to offer. One of my favouite exhibits at the museum is the Waddesdon Bequest which is housed in Room no. 45 of the museum. It is an impressive collection that was bequeathed to the museum by Baron Ferdinand de Rothschild, M.P., when he died in 1898. The collection was built up by Baron Ferdinand and his father and is made up of rare and precious pieces of jewellery, plate, enamel, carvings etc. The museum is open daily from 10.00–17.30 and entry is free. Free tours lasting 3-40 minutes run throughout the day. You can also book paid tours where trained guides will take you to various galleries in the museum. Another of London's most famous landmarks is Big Ben. Everyone who comes to London goes back with a Big Ben souvenir. Big Ben is a part of the Palace of Westminster, which also houses the Parliament. The UK Parliament is open to visitors year round. You can opt for a self-guided audio tour or book tickets for a guided tour. This can be done in advance online or on the day from the Ticket Office. This beautiful and historic cathedral is a masterpiece of architecture. The cathedral dedicated to St Paul, the Apostle, is the vision and work of the famous architect Sir Christopher Wren. The present day cathedral is the fourth one to be built on the site after the ealier were ones destroyed. The dome of the St Paul Cathedral is an intrinsic part of the London skyline. And wen you step inside the cathedral, you cannot but marvel at its awe-inspiring interior. The cathedral is set over five levels with topmost level (the Golden gallery) offering unrivalled, panoramic views over London. Another interesting gallery is the Whispering gallery - where a whisper from one side can be heard up to 100 feet away. The cathedral is stunning inside and out and for lovers of architecture, I would definitely recommend a visit. Located in the heart of London, Trafalgar Square is a major tourist attraction. In fact, it is the fourth most popular tourist attraction on the earth with more than fifteen million visitors a year. The square includes a large central area at the very middle of which is Nelson's Column. The column is flanked by two fountains and guarded by four bronze lion statues. For years, the square has been used to celebrate Christmas and New Year, sporting events, music shows, and even political demonstrations. This one needs no introduction. Buckingham Palace is one of the most iconic and well-known attractions in London. It has been the London residence of the Royal Family since 1837. There is lots to see and do at the Palace. You can visit the State Rooms, experience the Changing of the Guard and see the impressive collection of paintings in the Picture Gallery. You may also be interested in visiting the Royal Mews and the Queen's Gallery. Article contains affiliate links, which means we may receive a small commission if you click a link and purchase something that we have recommended. Clicking these links won't cost you any extra money. Wow awesome, I love the London Eye!